Kentucky performed as a top seed should, winning convincingly, building momentum and taking confidence to Syracuse. Ashley Judd isn’t the only star fan, Grammy-nominated rapper Drake was at Saturday’s game and gave hi-fives to the Kentucky coaches. Cornell is going to its first ever Sweet 16 after exposing Wisconsin in a 18-point victory. Meanwhile, the Big Red feel like they belong and will be playing their regional semifinal game just under 60 miles away from campus. Washington continued its improbable run into the Sweet 16 Saturday. The Huskies are coming together as the East Region bracket falls apart, playing their best basketball in a long time. The Seattle Times is asking… why can’t the Huskies continue this run? West Virginia handled the pressure and Joe Mazzulla and Darryl Bryant got redemption in their win over Missouri. Mazzulla showed heart in the Sunday win, the Charleston Gazette says. Butler has advanced to their third Sweet 16 in eight years, and while they will be a big underdog to Syracuse on Thursday, they’ve shed the Cinderella label. Xavier, on the other hand, is one of just two programs in the country to achieve the Sweet 16 in each of the past three years (the other being Michigan State), and they’ve got a label they aren’t too big on either: “mid-major”. A day after the BYU season ended, head coach Dave Rose still thinks his Cougars had a “special season.” They will lose seniors Jonathan Tavernari and Chris Miles to graduation and freshman Tyler Haws will head off on his two-year Mormon mission, but they also have two kids returning from missions and expect to be a strong contender in the MWC again next season. Murray State also heads into their offseason feeling pretty good about their accomplishments, and with only two key contributors graduating and freshman forward Ed Daniel looking ready to be an Ohio Valley Conference star, head coach Billy Kennedy feels pretty good about the future of the program. And, finally, while it is never too early to get an Arinze Onuaku update (still somewhere between questionable and unlikely for Syracuse vs. Butler on Thursday), Wesley Johnson offered up a pretty good assessment of his hand injury with his play on Sunday. It may be surprising to hear from Ali Farokhmanesh, but the gutsy shooter claims that open looks are sometimes the harder shots to make, as a shooter has too much time to think. According to Tom Izzo, the odds of Kalin Lucas having a torn ACL are around 85%. If that is the case, his season is likely over. When Tennessee and Ohio State will meet, it will be a rematch of their 2007 tournament game, in which the Volunteers led by 17 and OSU needed a Greg Oden block at the buzzer to save a one point lead. Kansas coach Bill Self asserts that Northern Iowa shouldn’t be surprising the country as much as they are, claiming that the Panthers are not Cinderella. According to Fox News, the NCAA needs Evan Turner, who can provide the closest substitute to the highly anticipated Kansas vs. Kentucky matchup. If both Kentucky and Ohio State advance to the Final Four, they would not meet until the title game. Team of the Week. New Mexico. The obvious answer here, as the Lobos this week knocked off BYU at the Marriott Center to clinch at least a portion of the regular season title, then followed that up by knocking off TCU back at The Pit to wrap up their MWC schedule with their 14th straight victory after starting out the conference season 0-2. The Lobos will head to Las Vegas as the #1 seed and have the potential to take home perhaps a #2 seed in the NCAA tournament should they extend their winning streak to 17. Player of the Week. Darington Hobson, Jr, New Mexico. The junior JuCo transfer wrapped up this title, as well as my vote for the MWC Player of the Year, by leading his team to a win at BYU and a MWC title. Along the way this week, he averaged a mere 20 points, 14 rebounds (he in fact had exactly 20/14 in both games this week) and 5.5 assists, and had the key defensive play at the end of the Lobos win over BYU when he rejected Noah Hartsock’s game-tying attempt in the closing seconds. Newcomer of the Week. Hobson. Game of the Week. New Mexico 83 BYU 81. 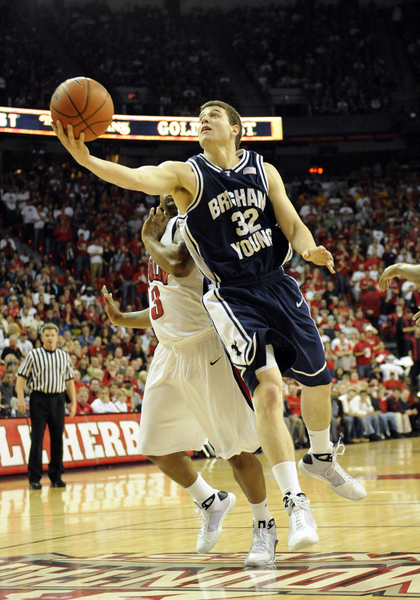 While this game came down to the wire and provided plenty of drama in a game for the conference regular season title, it is unfortunate that this game may be more notable for what didn’t happen than what did, specifically BYU’s junior guard Jimmer Fredette riding the pine for all but 29 seconds in the second half due to an “upset stomach.” The Cougars did have backup point Michael Loyd step up in Fredette’s absence to the tune of 19 points, but there is little doubt that the Cougars were at less than 100% effectiveness without their best player. The other story that came out of this matchup that had little to do with the game was New Mexico head coach Steve Alford aiming an insult at BYU senior forward Jonathan Tavernari after the game. Nevermind that Tavernari’s behavior in the closing minutes of the game was suspect at best, Alford was somewhat out of line. As far as the game goes, there were plenty of great moments, but most fans are left wanting a rematch in Vegas, preferably with a healthy Fredette. Game of the Upcoming Week. The MWC Tournament Championship Game, March 13, 4pm, Versus. The remaining games in the MWC regular season schedule are all more or less snoozers, although UNLV, San Diego State and BYU will have to avoid slipping up against Wyoming, TCU and Air Force, respectively. But, at this point in the season, all eyes turn toward the MWC Tournament in Las Vegas next weekend, in what should feature some very competitive semifinals and a great final. At this point, there are four teams with NCAA dreams (New Mexico, BYU, UNLV and San Diego State) and a couple others (Utah and Colorado State) with their eyes on the NIT (or potentially, one of the other fourteen lesser post-season tournaments that have popped up recently – ah look, there goes another one now). While that makes for a banner season in the MWC, the concern around the league is not just getting to the tournament, but advancing. With that in mind, a brief look at how high (in terms of NCAA seedings) and how far these teams can go. New Mexico – The Lobos will likely end up somewhere between a #2 and a #4 seed. If they roll through the MWC Tournament and get maybe one or two other breaks, they could potentially get up to a #2, while if they falter, say in the semifinals, they could slide to a #4. Split the difference and put ‘em down for a #3. In terms of how far they can go, clearly a team looking at those kinds of seeds has their eyes on at least the Sweet Sixteen, but a night of cold shooting especially at the foul line could cause the Lobos to underachieve. Their worst potential matchup would be with a team with a lot of size that could neutralize New Mexico’s rebounding strength, a team like Gonzaga, Wisconsin or Georgia Tech. In the end, I say this is a Sweet Sixteen team, but likely no further. BYU – BYU’s lack of great wins will probably knock them down a notch or two in seeding, so even if they are able to run through the MWC Tournament, they probably get a #4 tops. More likely they are looking at a #5 and could slip to a #6. 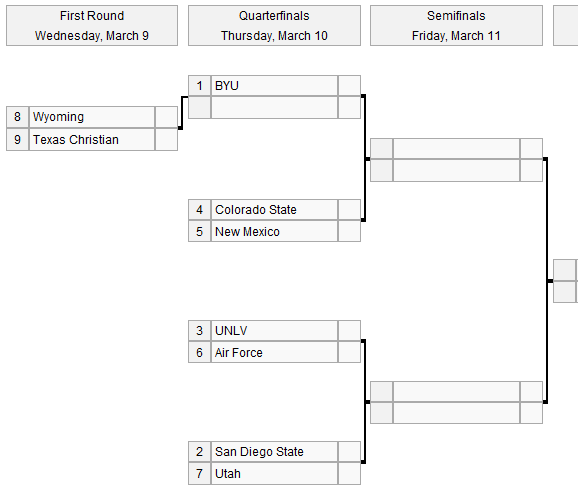 However, BYU may be a more dangerous team in the tournament than New Mexico. The Cougars are one of the most efficient teams on both sides of the court and feature not only a boatload of great shooters, but a strong bench as well, and this is a more athletic team than it is normally given credit for. BYU is also a team that can succeed not only in high-tempo games, but in slower grind-it-out games. I can see this team as a Sweet Sixteen team with a puncher’s chance of going a step further. UNLV – The Rebels have enough good wins this season to more or less ensure inclusion in the tournament and they should draw a first-round battle as a seed somewhere in the #7-#9 range. Their chances of advancing depend a lot on matchups, but this is not a team that is likely to be playing on the second weekend of the NCAA tournament. San Diego State – The big question for the Aztecs is not so much where they will be seeded, but if they will be seeded. A big run through the MWC Tournament is the only way that Steve Fisher will be resting easy on the night of March 13, but a run to the final would at least give SDSU another quality win to hang their hat on. Either way, even if the Aztecs do get to dance, they’ll likely be doing so with a double-digit seed, somewhere from #11 (if they do win the MWC tourney) to #13 (if they are among the last teams in. I’ve got a hunch this team will get a #12 seed, and while they are athletic enough to do some damage, they’ll likely bow out quickly. Looking back: Not much else to say here that wasn’t said above. The Lobos have wrapped up their conference schedule and by the time they play again they will not have lost in over two months. Roman Martinez dropped 19 points and five threes on TCU in his senior night performance, and junior point guard Dairese Gary has been big lately as well, having averaged 21ppg over the Lobos last three games and has been clutch down the stretch, routinely being the guy getting to the line and knocking down his shots from the charity stripe in the closing minutes of games. Looking ahead: The Lobos get a week off to prepare for their trip to Vegas where they will open play with a matchup against the winner of the Air Force/Wyoming game before moving on to more challenging fare. Looking back: BYU’s four losses on the season have come at Utah State, at New Mexico, at UNLV, and then at home against New Mexico without their best player for much of the game. They swept the season series against in-state rival Utah, and are all ready to receive a fairly high seed in the NCAA tournament. However, despite a bevy of accomplishments, it will go down as just another season if the Cougars are unable to advance out of the first round of the NCAA tournament, something they have been unable to do in the 11-year life of the MWC. The higher the seed the Cougs get, the easier it will be for them to accomplish that goal, so a strong performance in Vegas next weekend will be vital to BYU’s tournament chances. Looking ahead: BYU wraps up the regular season by travelling to TCU on Saturday, then will face the Horned Frogs again on March 11th in the quarterfinals of the MWC Tournament. Looking back: After the BYU loss, the Aztecs had just two games left on their schedule, games that they were expected to win, and they took care of the first half of that equation this week with a win over Colorado State on Wednesday. SDSU got eight straight points from junior point guard D.J. Gay to extend their lead to 33-19 at the half, and the Rams never really challenged again. Gay wound up with a team-high 16 points, while freshman forward Kawhi Leonard added 14 points and 15 rebounds and junior forward Malcolm Thomas added 10 points, eight rebounds and five assists. Looking ahead: The Aztecs wrap up the regular season with a trip to Air Force, then will travel to the MWC Tournament, where they will be a three-seed with a win and a four-seed if they lose and UNLV wins. Either way, they are locked into a matchup with either Colorado State or Utah in the quarterfinal, and a likely matchup with either BYU or New Mexico in the semifinal, a game which will be huge for the Aztecs NCAA tournament chances. Looking back: Much like the Aztecs, the Rebels are in the midst of a couple games they should win to wrap up the season and they’re halfway there, having polished off Air Force on Saturday by 30 behind a career-high 21 points to go along with eight rebounds from sophomore forward Chace Stanback. The Rebels dominated on the glass and shot 59% from the field, while lighting it up from three as well at a 48% clip. Junior guard Kendall Wallace added five threes. Looking ahead: The Rebels can move up to the three-seed in the MWC Tournament with a season-closing win over Wyoming paired with an unlikely SDSU loss to Air Force, and like SDSU they’ll face either Colorado State or Utah in the quarters and either BYU or New Mexico in the semis. Unlike the Aztecs, the Rebels seem to already have their ticket to the NCAA tournament punched, barring a bad loss between now and then. Looking back: The Utes are all alone in fifth place, the highest they have been this season, thanks to their win over Wyoming on Saturday coupled with a pair of Colorado State losses. Utah got 33 total points from senior Luka Drca and junior Carlon Brown, the two most capable scorers in an inconsistent lineup, and Drca in particular made this win possible with 10 of his 17 points in the last six minutes of the game. However, as if to highlight their inconsistencies, the Utes failed to have a single player score in double figures in their 20-point loss to BYU on Tuesday and the entire team when over 8:30 of game time without scoring a single point ranging from the end of the first half through the start of the second and the team shot just 27% and turned the ball over 17 times. Looking ahead: Utah will have a chance to get back to .500 on the season and wrap up the fifth seed when they travel to Colorado State on Saturday in a battle of the middle-of-the-pack MWC teams. Looking back: For the first time all season, the Rams have lost four in a row, following a week in which they dropped a couple road games after giving up big runs. Against TCU on Saturday, the Frogs finished the game on a 20-6 run to come back from an eight-point deficit with 8 minutes left to win by six. Then, at SDSU on Wednesday, the Aztecs finished the first half on a 16-6 run to take a 14-point lead into the half, from which the Rams never recovered. Junior forward Andy Ogide continued his strong play of late, however, averaging 18.5ppg and 12rpg this week. Ogide has scored in double figures in nine of his last ten games, and in the one that he didn’t hit double figures, he was still the team’s leading scorer. Looking ahead: The Rams host Utah on Saturday in a battle for the five-seed in Vegas, where they will have a tough quarterfinal matchup with either SDSU or UNLV. Looking back: This was probably the Horned Frogs’ best week of games since early January, and when you look at the 1-1 record with just a win over Colorado State to show for it, you get why TCU is down here in the dumps. TCU did get some signs of life from senior forward Zvonko Buljan (14.5ppg/11rpg) and senior swing Edvinas Ruzgas (12.5ppg), and rode some hot shooting (7-13 from three) against CSU to the week’s lone win. Looking ahead: The Frogs are going to get a double-dose of BYU over the next week: they’ll host the Cougs on Saturday then meet them in the quarterfinals of the MWC Tournament. Looking back: The Cowboys closed out Air Force late on Tuesday night with a 10-2 run to seal, well, nothing more than eighth place in the conference. But, the highlight for Heath Schroyer’s team over the back-end of the schedule has been the emergence of freshman guard Desmar Jackson as a legitimate scoring threat. Jackson had 31 in Wyoming’s loss to Utah on Saturday, then followed that up with 12 points and five assists against the Falcons, and has scored in double figures in nine of his last ten games. Looking ahead: The Cowboys will be playing the rest of their games this season at the Thomas & Mack Center in Las Vegas. They’ll face UNLV there on Saturday to wrap up their regular season schedule, then face Air Force there in the first round game of the MWC Tournament. Looking back: It’s been a rough season for the Falcons (again), with injuries decimating a roster that was already the least talented in the conference. And while they will likely finish up with just a 1-15 conference record (a one-game improvement over last year, mind you), they have fought it out right to the end. They put a scare into New Mexico a week ago, and this week (after getting demolished by UNLV in Colorado Springs), got to with a point of Wyoming late on Tuesday before folding down the stretch and cementing their hold on last place. Looking ahead: The Falcons host SDSU on Saturday, then get a rematch with Wyoming, this time on a neutral court in the MWC Tournament. According to a well-connected Kentucky columnist, Sunday will be junior Patrick Patterson’s Senior Day. We know that John Wall and DeMarcus Cousins will not be in a UK uniform next year either, so why not end the charade and celebrate their final games at Rupp as well? The Mountain West reprimanded New Mexico coach Steve Alford for his embarrassing outburst against BYU guard Jonathan Tavernari on Saturday night after their game. We mentioned it last night, but Alford’s later admission that he was just trying to congratulate Tavernari on his career rings a little hollow given the heated circumstances of the game, the jawing between Tavernari and Darington Hobson in the final minute, and the subsequent result with Alford caught on tape. Next time just tell us the truth, Coach. We really don’t understand nor can we agree with the decision by Binghamton brass to punish itself by removing its team from the America East Tournament a mere three days prior to the opening round. It was bad enough when USC officials threw their promising team under the bus midway through the 09-10 season, but the players who remained at Binghamton along with interim coach Mark Macon made the best of a horrible situation this year and actually far exceeded expectations. The Bearcats finished 8-8 in the conference and were scheduled to be the #5 seed in the tournament. In a year without a truly dominant Am East team, imagine the story if Binghamton had been able to claw its way to the NCAA Tournament again this year! It doesn’t make a whit of sense to us to punish the remaining players for prior transgressions, but the school has consistently made poor decisions in this arena for some time now, so it shouldn’t surprise us. Some awards: In the WCC, Gonzaga’s Mark Few and Matt Bouldin are the 2009-10 COY and POY, respectively, while in the Big South, Coastal Carolina’s Cliff Ellis and Radford’s Artsiom Parakhouski were likewise. Seth Davis is back this week with one the absolute best features around this time of year… analysis from coaches off the record about the top teams in each conference. This week his Deep Throats discuss the Big 12, Pac-10, Mountain West and Atlantic 10. It’s good to know that we were right about Texas all along (“guys not knowing their roles and not knowing their identity offensively”). Even though Philadelphia University’s Herb Magee is reeling him in for this particular title, Northern State’s Don Meyer is considered the winningest NCAA men’s basketball coach of all time because the NCAA counts ALL wins at all four-year colleges as long as the coach spent at least ten years at NCAA schools. Meyer, who announced a week ago that he would retire at the end of this season, coached his final game on Saturday night — a loss to Southwest Minnesota State. Meyer retires with a record of 923-324. Much respect, sir. Godspeed and good health to you. A day ahead of his team possibly taking over the top spot in the rankings, Syracuse’s Wesley Johnson is enjoying the ride, and admits that he never could have predicted that the Orange would have ever been considered the #1 team in the land this year in a Skype interview he did with Fox Sports’ Jeff Goodman on Sunday. In an article by Lexington Herald-Leader writer Jerry Tipton, Kentucky chief John Calipari claims that a couple of his players were “sleepwalking” through the whole game. He doesn’t specifically name the somnambulists, but — careful not to take anything away from the Volunteers’ effort — he cites a combination of the quick turnaround from Thursday’s late game against South Carolina and (more alarmingly) what he feels is inexperience among some of his players in preparing themselves for important games. Given Calipari’s recent statement about just wanting to “get on to the tournament,” it’s a legitimate question to ask: has ennui crept into the Wildcat camp? Seriously, Steve Alford? Yes, you are hearing correctly, Alford really does call Jonathan Tavernari that name right at the end. This sure makes the chance of a New Mexico-BYU rematch in the finals of the Mountain West tournament an exciting prospect. In the meantime, maybe someone can get Alford to echo his mentor by saying, “If Tavernari wants to sit down and talk with me…I’ll explain things to him!” Come on, Coach. You’re better than this. Team of the Week. San Diego State. While New Mexico and BYU took care of business to keep themselves in line for a showdown on February 27th for the regular season title, it was the Aztecs who made the biggest waves this week, knocking off UNLV on Saturday and getting a win in Fort Worth on Tuesday to vault ahead of Vegas in the conference standings. In the process, for the first time this season, there is some question as to who would be the next team in line for an at-large NCAA bid after the two teams at the top of the leaderboard. The Aztecs still have a chance for another big win when they travel to Provo on Wednesday, and they may need that one to solidify their NCAA chances. Player of the Week. Billy White, Jr, San Diego State. It was a wide open contest for this honor this week, with the usual suspects all turning in one excellent game and one lesser game. So, this is a perfect week to honor someone else, a guy who put together two very good games in leading his team to the TotW honors and third place in the conference. White averaged 18 points and seven rebounds this week and had some high-flying highlights in leading the Aztecs to an important win over UNLV. White has not had the kind of statistical improvement that many in the Aztec program expected this year, although he is averaging 11 points and five rebounds per game, perhaps in part due to his running mates in the SDSU front line, freshman Kawhi Leonard and junior transfer Malcolm Thomas. But, for the Aztecs to live up to their potential, they need White to be slashing to the basket, playing above the rim and defending athletic frontcourt players, exactly what he did this week. Newcomer of the Week. Kawhi Leonard, Fr, San Diego State. Leonard wins this one on the strength of his play against the Rebels. Leonard scored 13 points and pulled down 14 rebounds in the Aztecs win on Saturday, but did so many other things to help his team win. He often brought the ball up against UNLV pressure and he spent much of the day hounding UNLV’s best player, junior guard Tre’Von Willis, into five-for-15 shooting. While New Mexico’s junior Darington Hobson is undoubtedly the MWC’s most versatile player, Leonard is growing into a legitimate threat to usurp that title. Game of the Week. New Mexico 68, Utah 65 (OT). For much of New Mexico’s win over Utah on Saturday, it seemed like the Lobos were on the verge of pulling away. They led by as many as eight a couple times in the first half, only to have the Utes reel them back in. In the second half, the same pattern held: New Mexico jumping ahead, Utah slowly scraping back. In fact, between the 17 minute mark in the first half and the three minute mark in overtime, Utah never led, but the Utes did get back to even with under two minutes in regulation with six straight free throws, but still needed a corner three from junior guard Carlon Brown with two seconds left to send the game to overtime. Utah got the first points of the OT, about two minutes in on Brown layup, but a big three by senior forward Roman Martinez gave the Lobos back the lead for good, although they did have to survive a couple potentially game-tying threes in the waning moments by Brown and freshman guard Marshall Henderson. Game of the Upcoming Week. San Diego State @ BYU, February 24th, CBS College Sports. Both teams have a lot to gain and a lot to lose in this matchup. If the Aztecs hope to feel somewhat comfortable with their at-large chances headed into the MWC tournament, they need to win this game (along with running the table against the rest of the lower-level MWC teams they face). If BYU wants to have a chance at winning the MWC regular season championship outright, they’ll need to win this game. While the Cougars will certainly be the favorite playing in front of a partisan Marriott Center crowd, the Aztecs have been hot lately and have enough athleticism to give BYU fits, as they showed a month ago in a close loss in front of SDSU’s home crowd. UNLV has now lost three games in a row and while those three games were all tough MWC battles (a loss at home to New Mexico, and road losses to San Diego State and Utah), it may be time to re-examine the Rebels’ tournament credentials. Currently sitting at 19-7 with an RPI of 44, the Rebels remaining regular season games are games that they absolutely must win: home games against Colorado State, TCU and Wyoming wrapped around a road trip to Air Force. None of those wins is going to do a whole lot to help the UNLV resume, but a loss anywhere would kill them. Their best wins on the season are a win at New Mexico (RPI #10), home against BYU (19), Louisville (30) San Diego State (39), Nevada (68) and a road win at Arizona (89). There are no particularly bad non-conference losses (a neutral site loss to USC, RPI 82, being the worst), but the two conference losses to Utah are unhelpful, to say the least. The good news for the Rebels is they get to play their conference tournament at home in the Thomas & Mack, giving them a nice little nudge towards capturing the MWC’s automatic bid, but assuming they don’t win the title, what do they need to do to give themselves the best chance at an at-large bid? Four more conference wins will put them at 23-7 with an RPI still somewhere in the mid-to-low 40s. In the first round of the MWC tourney, they’ll likely play either Colorado State or Utah, and a loss in that first round will have them scouting Manhattan hotel rates for a potential NIT run. Assume they win and advance to the semis, and they’ll have either New Mexico or BYU waiting for them, where a win would be very good and a loss would not be horrific. Lose in those semis and they sit at 24-8; win there and lose in the finals and 25-8, plus the additional good win might be enough. Just enough. Especially considering the eventuality that the bubble will likely tighten up if teams like Butler or Old Dominion or maybe UTEP have missteps in their own conference tournaments. Long story short, the Rebels still have a pretty strong resume, but they would certainly love to have a redo in those Utah games. Looking back: After last week’s two big wins, it would have been understandable if not entirely acceptable for the Lobos to be a little flat for their trip to underachieving Utah on Saturday. And while Steve Alford’s club was not as sharp as it had been the week prior, they were good enough to control the game and escape with a three-point overtime win against an improving Ute team. On Wednesday, the Lobos returned to Albuquerque for some home cooking and along the way they scored a big 22-point victory over a reeling Wyoming team. The win was Alford’s 300th Division I win in his career and was highlighted by another terrific Hobson performance: 20 points, 10 rebounds and six assists. Martinez was also strong for the Lobos, filling the stat sheet with 13 points, seven rebounds, three blocks, three steals and three threes. Looking ahead: New Mexico host Air Force on Saturday, then has a tricky roadie to Fort Collins to face Colorado State. Win both and the Lobos likely set up a one-game playoff for the MWC regular season championship against BYU in Provo on the final Saturday of February. Looking back: BYU had a week to stew over their loss in Vegas, and when they finally got a chance to take their frustrations out on someone wearing a different jersey, it was Air Force on the receiving end. The Cougars were on fire early, shooting 67% from the field in the first half while knocking down 10 of their 14 three-point attempts and they built up a 53-20 first half lead before cruising to a 43-point victory. Senior forward Jonathan Tavernari led the team with five threes and 19 points, with junior guard Jackson Emery just behind him with four threes and 18 points. The Cougs second game of the week was slightly more competitive, BYU winning by only 22 over Colorado State, but while the scoring was balanced against Air Force, the CSU game was a Jimmer Fredette special. The junior guard had 36 points, with six threes and six assists for good measure. Once again the Cougars were on fire from the field, shooting 52% from the field and hitting 12 of their 25 attempts from behind the arc. Sophomore forward Noah Hartsock added his first career double-double with 12 points and 12 rebounds and he spearheaded a strong Cougar effort on the glass. Looking ahead: One more tune-up for the Cougs when they travel to Laramie to face the Cowboys on Saturday, then into the fray with home games against San Diego State, a monster game against New Mexico and their trip to Salt Lake to face rival Utah. Looking back: When the Aztecs hosted UNLV on Saturday, they knew it was a must-win game and they played like it. They outhustled the Rebels, played better defense, got contributions from up and down the roster and did it all with a calmness and confidence that belied their relative youth. They beat the Rebels on the glass (39-30), racked up all sorts of defensive gems (nine blocks, nine steals) and actually made their free throws (23/31 from the line, a vast improvement over their 60% season average. White led the team with 19 points, Leonard added his 13 points and 14 boards, but even those who didn’t rack up big numbers made contributions. Thomas had four blocks and four assists, freshman guard Chase Tapley had three steals to go along with 11 points and senior guard Kelvin Davis added a couple of threes, and in the end the Aztecs walked away with a 10-point victory. The Aztecs followed up that big win with a workmanlike effort against TCU by dominating the Horned Frogs inside. SDSU outrebounded TCU 34-24, and scored 59 of their 68 points either in the paint or at the free throw line. In the process, the Aztecs shot 61% from the field. Looking ahead: At this point, they are all big games for the Aztecs. They host Utah on Saturday then travel to BYU on Wednesday. While the BYU game is certainly a very difficult game for SDSU, the Utes have been playing well lately, and if they get caught looking ahead to the Provo trip, the Aztecs could slip up at home. Looking back: A week ago at this time, the Rebels had just been whooped by New Mexico and were facing a fairly difficult week ahead with visits to San Diego and Salt Lake City. Everyone knew it would be a tough week, but not many suspected that at the end of it, the Rebs would be riding a three-game losing streak. Against the Aztecs, Vegas was exposed a bit compared to SDSU’s length and athleticism. While their quick guards like Willis and freshman Anthony Marshall kept them in it for awhile, UNLV couldn’t get a lot of good looks and wound up shooting just 35% from the field and only three of 17 from deep. The Rebels didn’t get a lot of time to recuperate from that loss before making the tough trip to the Huntsman Center on Wednesday. Once again, for the third game in a row, UNLV not only lost but was outplayed from start to finish. The Rebels never even led on Wednesday night, and beyond Willis’ 32 points, didn’t get much in the way of positive offensive contributions. UNLV stayed in the game by forcing 16 turnovers, which they converted to 22 points, but in the end Willis missed a tough challenged layup on a fast break and then a three with a guy in his face a possession later, and UNLV lost by five. Looking ahead: The Rebels host Colorado State and TCU this week and need to get back on track immediately. Looking back: The Rams played just once this week, and their 22-point home loss to BYU reaffirmed their position in the MWC pecking order: nowhere close to the top of the pack, but better than the dregs. In their two matchups with BYU this season, they have now lost by an average of 33, and have lost by over 20 points per game in their five matchups with the teams above them in the MWC standings. Junior forward Travis Franklin did have a nice performance against the Cougars, leading the team in points, rebounds and assists (14/7/5), and CSU did have five players score in double figures, but the Rams showed no ability to stop BYU and their struggles from behind the arc (4/17) doomed them to another blowout loss. Looking ahead: The MWC gauntlet continues for the Rams: a roadie at an angry Vegas team on Saturday, then a chance to host New Mexico on Wednesday night. Looking back: It has been a frustrating season for Jim Boylen and his Utes. This squad has struggled shooting the ball (just 43% from the field on the year), has yet to find a legitimate point guard (335 turnovers on the season, just 303 assists), and have had little injuries and other personnel issues bug them throughout the year. And yet, here in the middle of February, the Utes are playing their best ball of the season and have turned into a team that can rise up and bite the teams above them. UNLV has learned that lesson quite well, but even New Mexico had to consider itself fortunate to escape SLC with a win this week. Brown has struggled living up to the expectations of him as an offensive go-to guy, but this week he scored 18 points in each game and was the man down the stretch in both games. Henderson has also stepped up his game of late, averaging 15.5ppg this week, and with sophomore center David Foster able to clog up the middle defensively (he had seven blocks against a stubborn New Mexico team), the Utes are coming together on both ends of the court. Looking ahead: Utah hits the road this week: first stop San Diego on Saturday, followed by a visit to the Air Force Academy on Wednesday. Looking back: It’s the dog days of the season for the Horned Frogs. They’ve no chance at any type of post-season play, their coaches have started looking towards next season and their seniors only show up once a week at best (hey, sounds like my senior year… and my junior year… and… ). TCU was good enough to beat Wyoming in Laramie on Saturday. They got 21 points and seven rebounds from freshman forward Nick Cerina and senior swing Edvinas Ruzgas and junior guard Greg Hill both hit big threes down the stretch to tidy things up, but then got beat up and down the court by San Diego State on Tuesday in the most one-sided 17-point game you’d ever want to see. Looking ahead: Just one loss for TCU this week, as they head to UNLV to get torched on Wednesday night. Looking back: See above and increase exponentially. Players defecting from the program, the best player watching after knee surgery, the coach rapidly burning bridges. Good times in Laramie. This week saw the Cowboys drop to 2-10 in the conference (and just looking at that record reminds me that somehow this team beat San Diego State), and highlights for this team are few and far between. Freshman guard Desmar Jackson had 22 points, five rebounds, four assists and three steals in the loss to TCU, but followed that up with six turnovers and little else in the New Mexico loss. And junior forward Djibril Thiam had another solid week, averaging 10 points and seven rebounds this week, and has had a decent season, averaging 10 points and five rebounds over the year. Looking ahead: BYU comes to town on Saturday. Oh boy! Looking back: Just another miserable team at the bottom of the standings, although you get the feeling this one might still be playing hard. Which is not necessarily good news considering they just lost by 43 in their only game this week,at BYU on Saturday. But the Falcons just couldn’t do much right in that game (22 turnovers), and BYU was rested, inspired and on fire. Freshman wing Mike Fitzgerald led the Falcons with 13 points and four threes. Looking ahead: Things don’t get a whole lot easier for Jeff Reynolds and his team as they head to New Mexico before returning home to host Utah.